On Monday February 14th, we teamed up with Toy2R and Yoyamart to help launch Toy2R's new products in 2011. On display were the Kaiju Bossy Bear figures, the new 2-inch Domo Series, and the protos for Skelanimals Series 2... but the big draw was the launch of Toy2R's new low-priced 5-inch DIY platform, the Mini Qee! With seven different head shapes, the $15 Mini Qees are sure to be favorites with artists and toy customizers of all stripes. The party was a great success, thanks in no small part to Stephane, the perenially positive owner of Yoyamart; Kevin Winnik, head of Toy2RUSA; Matt Siegelbaum of Strongtree Images who shot all the pics in this post and many more; and of course all the artists who contributed work to this show to make it as strong as it was. We had dozens of artists show up; collectors, industry reps, the heads of companies, celebrities (see if you can spot any in the online gallery!)... champagne was enjoyed by all and it was a blast from start to finish! Many retailers have already ordered the Mini Qees, and they will be showing up in other US shops eventually. For now, if you want one, you need to head to Yoyamart. There are many more amazing pictures of this show: pics of the customs as well as people shots. I urge you to go check out the public gallery on Strongtree Images- you can share your favorite pics on Facebook, embed them into your blogs, tweet them... go nuts! I'd like to thank Kevin Winnik for asking me to help curate; this was a really fun project and I enjoyed it a lot. I'm looking forward to curating more toy shows in the future. The 20 custom Qees that I curated will be up in a special page in the Customs section of Tenacious Toys, and all the pieces that did not sell right there at the show, will be for sale on that page of TenaciousToys.com. In the near future, look for MANY Tenacious Toys artist collaborations featuring the artists in this show. I have already lined up projects with a bunch of them. Just kidding! For his first custom post-surgery, he annihilated this Alien Argus piece with some Monster Kolor paints for the late March show at Toy Art Gallery. Orisis cannot be stopped. He is now bionic, possessing superhuman painting abilities. 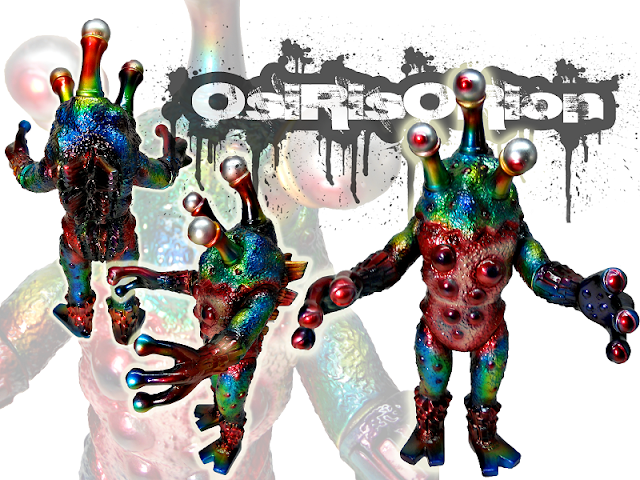 Look for an OsirisOrion x Tenacious Toys custom mini figure series coming soon! Woo-ha, bet you didn't see that one coming! Stay tuned... in the mean time check out Osiris' website and Flickr page.